details have been unearthed regarding director Alex Proyas’ (Knowing) adaptation of the 17th century epic poem Paradise Lost. Starring Bradley Cooper. it looks like the massive production will take place in Sydney, spanning 20 weeks of pre-production, eight weeks of principal photography, and 72 weeks of post-production, with the director utilizing motion capture to make the film. Men in Black III, stylized MIB3 and previously entitled Men in Black III-D, is an upcoming 3D science fiction comedy film starring Will Smith and Tommy Lee Jones. It appears Dorothy Gale is, once again, not going to be in Kansas any more. With the "Harry Potter" franchise winding down, Warner Brothers has set their sights on building another franchise geared toward young adults based on one of the most popular films of all time, "The Wizard of Oz." 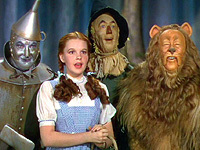 Warner Brothers has had two separate projects in development over the past year centered around wide-eyed Dorothy Gale from Kansas -- a role made iconic by Judy Garland in 1939 -- who finds herself swept off (literally) to a magical land full of eccentric creatures called Oz. The box-office take of"Alice in Wonderland" -- $133 million domestically, and counting -- makes this project seem even more attractive.